CUCADELLUM.ORG: Aprovació de la Llei de Consultes al Parlament. Ressó internacional, un recull de Vilaweb. Aprovació de la Llei de Consultes al Parlament. Ressó internacional, un recull de Vilaweb. Tot seguit es destaquen els principals articles i reportatges publicats en mitjans de comunicació de tot el món sobre el procés sobiranista català i la consulta del 9 de novembre de 2014. Euronews ha fet reportatges i connexions en totes les llengües en les quals emet. Mitjans com Le Monde, la BBC, The New York Times, Los Angeles Times, The Guardian... es fan ressò de l'aprovació de la llei de consultes, com el pas previ a la convocatòria de la consulta del 9 de novembre. 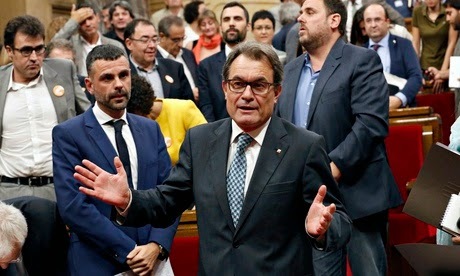 The Catalan parliament passed a law paving the way for a non-binding vote on secession on Friday, hours after finding out it wouldn't have a Scottish precedent to follow in the region's quest for independence. 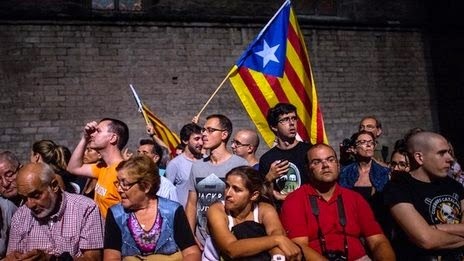 Le Parlement catalan a voté vendredi 19 septembre une loi autorisant une " consultation " sur l'indépendance de la région vis-à-vis de l' Espagne, contournant ainsi l'opposition de Madrid au référendum que le président de la Catalogne, Artur Mas, veut convoquer le 9 novembre pour poser une double question aux Catalans : " Voulez-vous que la Catalogne devienne un Etat ? 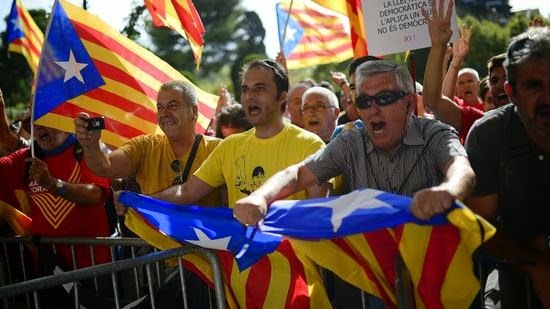 MADRID - Undaunted by the defeat of the Scottish independence movement a day earlier, separatists in the Catalonia region of northeastern Spain pressed ahead on Friday with plans to hold a similar vote there. A day after Scotland rejected independence, lawmakers in Spain's northeast region of Catalonia moved Friday to hold their own referendum on breaking away from Spain and forming a new European country. Voting 106 to 28, Catalonia's regional parliament approved a law granting its leader power to hold a nonbinding vote on independence. Catalonia's President Artur Mas is to comment shortly on the Scottish referendum result as he prepares his region for a similar vote in November. Mr Mas, leading a controversial drive for independence from Spain, is expected to speak at 13:00 (11:00 GMT). 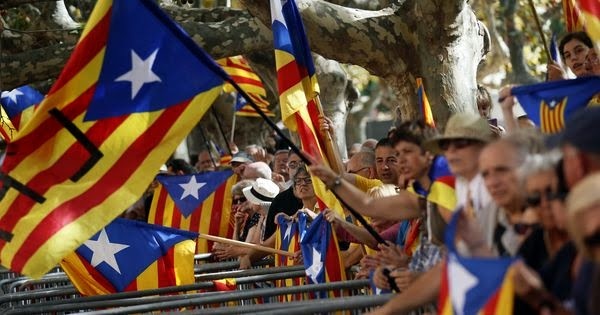 Spain's government opposes the Catalan "consultation" vote and is taking the dispute to the Constitutional Court. MADRID-A day after a majority of Scots voted against secession from the U.K., the parliament in the wealthy, industrial Spanish region of Catalonia approved a law to allow for its own, albeit nonbinding, referendum on independence. The 106-28 vote Friday set Spain on a path toward a legal and political crisis.